The color doesn't show up well here. It's a purplish/pink and the border is pale pink. Both yarns have little slubs of various colors. Very cute, soft and cozy. It has clear buttons with Pooh on them. The buttons are largely transparent in the picture, though! For awhile, I think I'll concentrate on these big needle knits for Lorelai since she'll outgrow them quickly. One note on the event this past Thursday, for anyone who was there, did you see how fast Stephanie can knit? She was knitting on the sock and she wasn't even looking at it. Amazing. The weather's nice today and was even nicer a couple of days ago (Tuesday), when it went up to around 72. Spring has arrived. 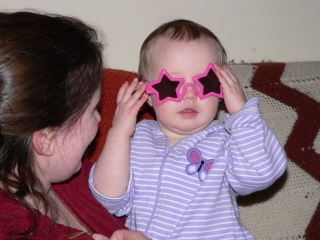 Our little star is 14 months old today. 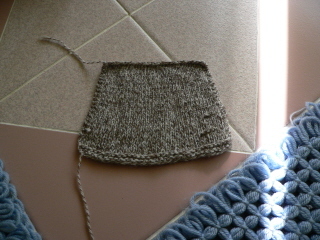 In deciding what to do with the yak/merino blend yarn, I made a swatch with 3 needle sizes. After washing and blocking, this stuff is so soft, I wish you could touch it through your monitor. It's heavenly. I decided on my original plan, gloves, and cast on these. The pattern is from the Knitter's Handy Book of Patterns, which is such a great resource. By the way, as we were driving home on Thursday night, I mentioned to Bill that I bought a wool/yak blend yarn. He said, "Yak? What's a yak?" I said, "I don't know, it's a yak." An animal with hair/fur that can be spun into yarn. 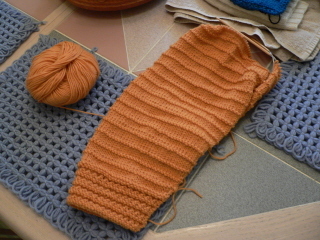 I had already been working on a pair of navy blue wool gloves and I made some progress on them yesterday. I'm just past the thumb gusset. They move pretty quickly from that point so I hope I'll get them done soon. I'm not at all in a hurry, though, since today's forecast calls for temperatures near 70. In other words, I have plenty of time to get these all done before I need gloves and mittens again. 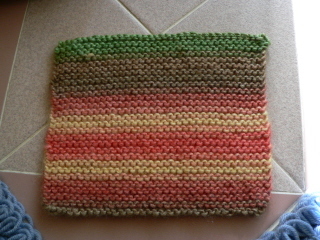 I finished a second square for Warm Up America with the yarn from the book launch event. Isn't this pretty yarn? Patons sws, wool/soy blend. It's nice to work with. I didn't expect such pretty yarn. When I opened the bag after we sat down, I said, "Wow, this is nice yarn. I was expecting...". Sandra said, "Red heart"? Yeah, I guess that's what I was expecting. 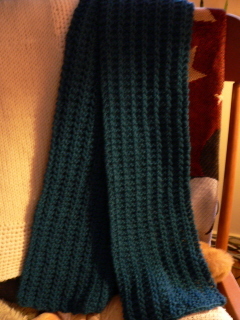 Here's the scarf I started. I love this yarn (Peruvia from Berroco). It's purple with a little blue. Very pretty. So, the weather is really starting to warm up. I need to get myself moving outside. I should really do something in the garden, rather than my usual wait until June, by which time I no longer care. Billy found an apartment and moved out over the weekend. That means I can turn that spare room into a little studio for myself. I can use the knitting machine or sew and not monopolize the kitchen. I'm very excited! The first chore will be to have the floor refinished. From there, it's all up to me. 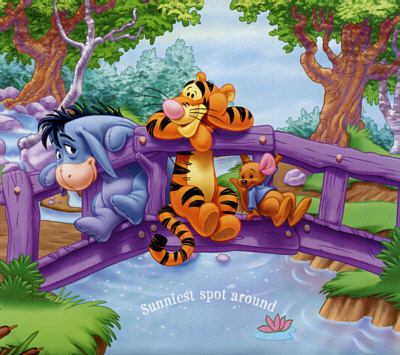 Pooh says let's get out there and start working. It's spring! Every couple of days, I check the stats of this site. I might find that two or three people have checked out the inner workings of my often confused mind. In fact, I'll bet I could name the two or three people who regularly read this journal/"blog". Sometimes, I'll see one or two first time visitors. That always interests me. I wonder how they found this site, what they're interests are. Of course, I wouldn't know because, with the exception of my ever-faithful friend, Kathleen, the only posts I routinely get in my guestbook are the advertisements. That's why I approve all the posts now. Imagine my surprise when I innocently opened the page to check counter stats today and found that 50 folks had visited this site for the first time today. Fifty. How did this happen, you ask? Undoubtedly, it is because I posted a comment on the Yarn Harlot's site. I'm still sort of in shock. 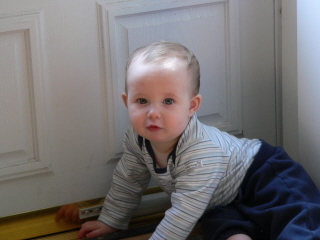 And thanks to Mardi for posting to the guestbook. Back to business. 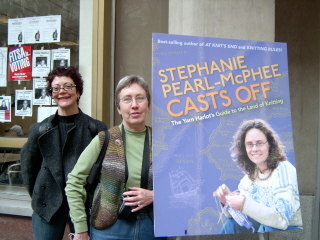 On Thursday, I trekked into the city to attend the book launch for Stephanie (aka Yarn Harlot) Pearl-McPhee's new book, Casts Off. Not being much of a social knitter, I really don't have any knitting friends and I was a little uneasy about partaking in all the festivities alone. 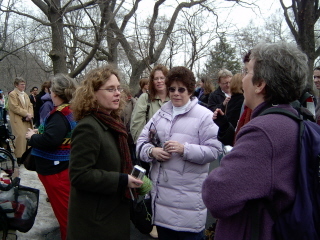 Through the comments on Stephanie's blog, I made the acquaintance of two lovely knitters and lo and behold, I was no longer solitary. I met Mardi and Sandra at Sandra's hotel early in the day and we began our personal "yarn crawl". We started off at School Products on Broadway. All three of us wound up buying a yak/wool blend here. It was funny how we were drawn back to this yarn again and again. We were literally petting the sample sweater. Seriously, this stuff is soft! I swatched it today. I'm anxious to get started on gloves with it. Our next stop was Habu Textile. and the staff would get it from the stock for you. Some pretty exotic stuff here. 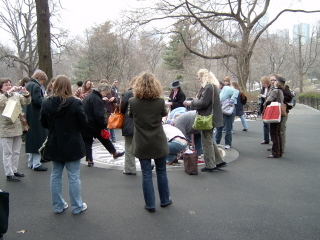 After visiting those two shops, it was time to go uptown to Strawberry Fields in Central Park to gather for sock pictures. 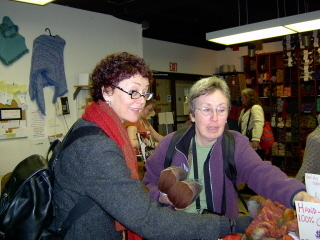 Sandra spotted Kay from Mason Dixon Knitting. 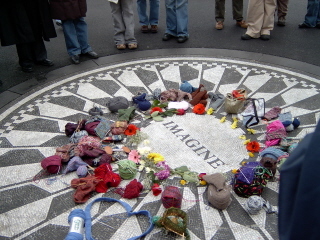 Stephanie was taking pictures of the Imagine mosaic. All the beautiful colors and textures add so much and enhance the ever-present flower wreath around the word. It was quite magical to see. It had been really chilly and cloudy early in the day but while we were all here, the sun started peeking through, promising better weather for the afternoon. 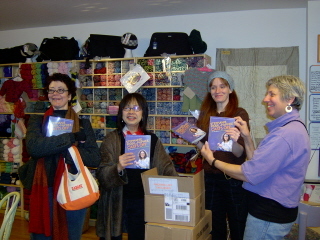 From the park, we made our way to Knitty City, where we witnessed the unpacking of the new books. Such excitement! This was one of the shops I was really hoping to visit. 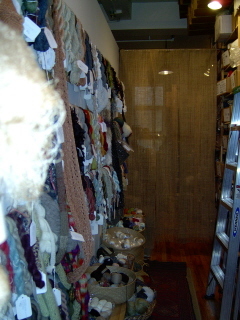 I probably did the most damage here, in fact, I bought more yarn here than at other shops. 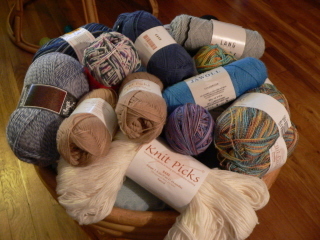 In all, lots of yarn followed me home on Thursday. Really. It wasn't my fault. You know how it is. Our next stop was Yarn Company, where I bought a book of patterns for toddler things and a kit to make a hat for Lorelai. Sandra said I was buying a "grandma" book. Yep! By this time, the sun was out and the temperatures had risen considerably. It was a downright nice day. We had a late lunch at Popover Cafe, very yummy, and started back downtown to FIT. As we entered the auditorium, there were bags on our seats with yarn, needles and info about knitting squares for Warm Up America. We cast on our squares and waited for the Harlot to make her appearance. This is an awful picture. 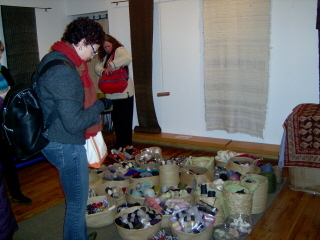 Although the room was lit enough so we could knit (just barely), it was not enough light for decent photography. Take my word for it when I say that the bohus sweater (I knew she'd wear it) is absolutely stunning. Better pictures are here. Stephanie talked for what I believe was at least an hour and a half, maybe more. For someone who insists she's nervous, I detected nothing of the sort. I thought she was warm, genuine and delightful. Her reaction to Joe's appearance in the front row was so sweet. After much laughter, she executed a small curtsy at the end and then entertained questions. Bill was off Thursday night and graciously came to pick me up after the festivities so I wouldn't have to lug my bag of yarn purchases home on the train. This was seriously welcome to this knitter! I had a great time and now that I have my own "traveling" sock, I hope that when I wear them, I'll remember the day and the fun we all had. Pooh says it's raining outside. Stay warm and dry. After my spurt of energy, I'm slowly moving along on those sweaters I'm knitting. I'm trying to think of what I'd really like to be done for this winter. That's probably a dumb thing to do, especially with forecasts near 60 this week. I think this means I'm really more "completion" oriented rather than "process" oriented. 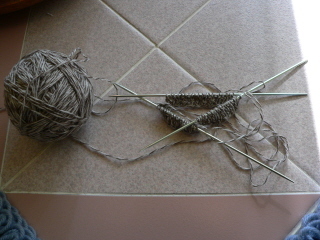 I love the knitting process but I sure do love it when something is done. I love the sense of accomplishment. Sue and I will be interpreting Forever Plaid next Thursday evening. We're working with a Suffolk interpreting student and this is her internship. She's attending the same program I graduated from. 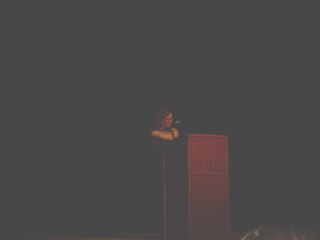 When we worked with BOCES, we had students all the time. Some interpreters don't like to work with students. They see them as rivals for future work. I always liked working with students, though. So, this has been fun. 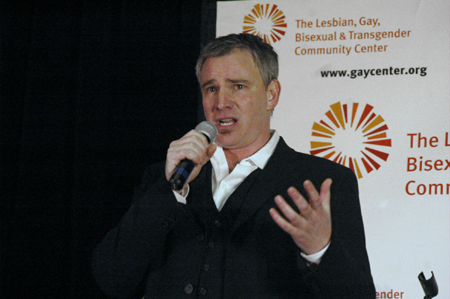 Speaking of theatre, in a way, Jan, Kelly and I recently saw Douglas in a cabaret show he performed with Todd and their friend, Sally Wilfert. 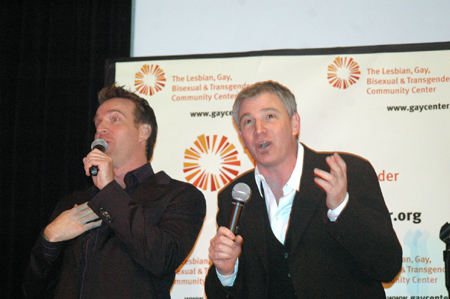 It was so great to see Douglas and Todd perform together, which I'd never had the opportunity to do before. I'd credit these photos but I can't remember where I found them. I apologize for that. 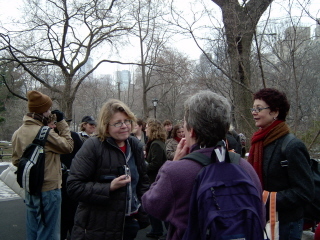 This was the first time Douglas and Jan had seen Kelly since before Lorelai was born. We were sitting right in front of the stage and as they walked up to the stage and when Douglas saw her, Kelly said his face lit up. She said that was worth the whole trip in just for that. 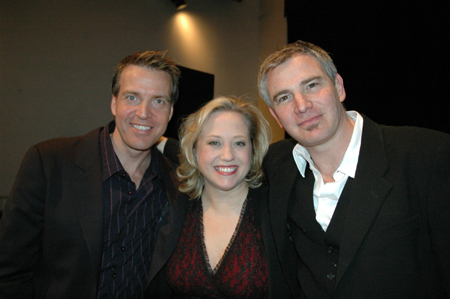 It's always fun to get together with Jan and see Douglas. We had dinner at a little Mexican place that had been recommended by Eric, who met us there but didn't go to the show. We asked Eric what he thought we should order and he said he didn't know. He never ate there, he just drank there. Ha! Anyway, I had a great cheese quesadilla. Slightly warmer today but still very windy. Well, maybe that's because we went to Applebees and CompUSA at the Airport Plaza. Just like the airport that's right next door, it's always windy there! I've been busy. Really busy. The finished projects are flying off the needles and I'm finally finding my way out from under the mountain of UFOs (WIPs?) that crowd my little craft corner. Let's get started, shall we? is finally complete! And, yes, they fit. Nice. I learned a lesson here and let's hope I don't forget it. 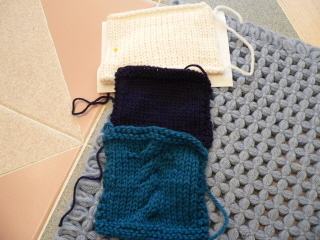 Gauge swatch. 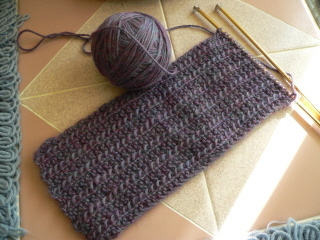 Knit a gauge swatch. 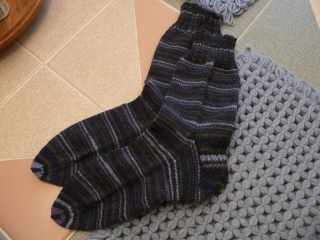 I also completed another pair of socks. 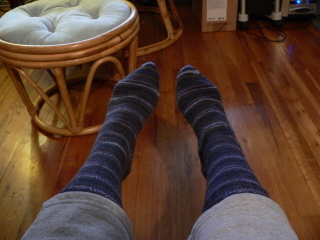 These are knit from a yarn I bought on ebay some time ago. The color is cocoa rose and I really like the wool, very soft. 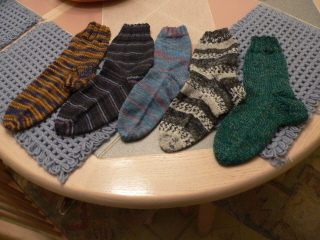 For these, I used the classic sock pattern from Nancy Bush's Folk Socks book. I finished the Harlot scarf I'd started. This was fun. I really like the pattern and I think I'll keep an eye out for some nice yarn to make this again. It would make a nice gift. My focus now is a sweater I started awhile ago. This is the sleeve. I've been working on quick projects lately. 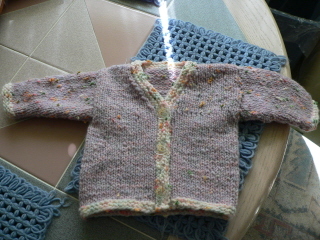 I really should concentrate on the two sweaters I'd started since I have other ideas I'm kicking around. Of course, sticking with this plan will be hampered by this. 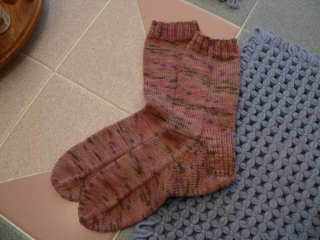 Sock yarn. Lots of it. Now that I currently don't have a sock project in the works, this stuff is seriously calling to me, especially the white in the front. I'm going to try my hand at kool aid dying and once that's done, you know I won't be able to resist knitting with it. I'm also planning a pair of navy blue gloves for my new jacket and a really cute fingerless mitt pattern from a magazine. How long could that take, right? Now, onto the other time-consuming part of my life at the moment. 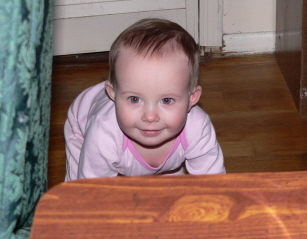 Can this little one keep you hopping? Oh, yeah. She's just so darn cute. Ta-ta, all. Back to the needles....after dinner! Yeah, it's March! Almost St. Patrick's Day!